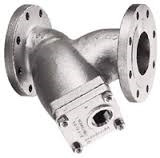 Stainless Steel Model 85 Y Strainer - 600# NPT - 1/2"
> Stainless Steel 85 Y Strainer - 600# NPT - 1/2"
Y-Strainers are typically used in applications where the amount of solids to be removed is small, and where frequent clean-out is not required. They are most often installed in gaseous services such as steam, air, nitrogen, natural gas, etc. The compact, cylindrical shape of the Y-strainer is very strong and can readily accommodate the high pressures that are common in this type of service. Pressures up to 6000 psi are not unusual. When steam is being handled, high temperature can be an additional complicating factor. A steam pressure of 1500 psi will often be found at temperatures of 1000 F. The strength of the standard Eaton Y-strainer design can easily accommodate these extreme parameters although the material of construction will probably be an alloy steel. A Y-strainer has the advantage of being able to be installed in either a horizontal or vertical position. However, in both cases, the screening element or leg must be on the downside of the strainer body so the entrapped solids can be properly collected and held for disposal.